Someone donated this large book of home designs to the museum this week, so I had to scan a few. 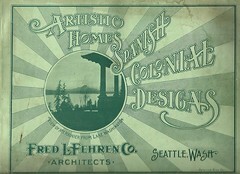 The book was printed in 1905 and the built homes are all in the Seattle area. If I lived a little closer, I’d be looking for some of these. Pretty likely that most of them still exist.